STOCKHOLM - U.S.-British scientist John O'Keefe and Norwegian scientists May-Britt Moser and Edvard Moser won the Nobel Prize in medicine on Monday for discovering the "inner GPS" that helps the brain navigate through the world. Their findings in rats - and research suggests that humans have the same system in their brains - represented a "paradigm shift" in the knowledge of how cells work together to perform cognitive functions, the Nobel Assembly said, adding that could help scientists understand the mechanisms behind diseases like Alzheimer's. "This year's Nobel Laureates have discovered a positioning system, an 'inner GPS' in the brain, that makes it possible to orient ourselves in space," the assembly said. Columbia University professor of neuroscience and Nobelist Eric Kandel told CBS News in an email, "This year's Nobel Prize in Physiology or Medicine recognizes an extraordinary set of contributions to brain science." The work of the three scientists "has illuminated the neural computation underlying a complex cognitive function: position in space - the first cognitive function we understand on the cellular level." O'Keefe, 75, of University College London, discovered the first component of this system in 1971 when he found that a certain type of nerve cell was always activated when a rat was at a certain place in a room. He demonstrated that these "place cells" were building up a map of the environment, not just registering visual input. Thirty-four years later, May-Britt Moser and Edvard Moser, a married couple at the Norwegian University of Science and Technology in Trondheim, identified another type of nerve cell - the "grid cell" - that generates a coordinate system for precise positioning and path-finding, the assembly said. Kandel told CBS News that the couple trained under O'Keefe. "This is crazy," an excited May-Britt Moser, 51, told The Associated Press by telephone from Trondheim. She said her husband, 52, had not yet found out about the prize yet because he was flying to the Max Planck Institute in Munich, Germany, to demonstrate their research. She said they had been a couple for 30 years. Hege Tunstad, a spokeswoman at the university in Trondheim, said May-Britt Moser "needed a minute to cry and speak with her team" when she found out about the prize. The Nobel Assembly said knowledge about the brain's positioning system may "help us understand the mechanism underpinning the devastating spatial memory loss" that affects people with Alzheimer's disease. The discoveries have also opened new avenues for understanding cognitive functions such as memory, thinking and planning, it said. "Thanks to our grid and place cells, we don't have to walk around with a map to find our way each time we visit a city because we have that map in our head," said Juleen Zierath, chair of the medicine prize committee. "I think without these cells we would have a really hard time to survive." Kandel explained to CBS News that "representation of space in the brain is not mediated by a single sensory modality, such as touch, vision, or smell. Instead, space is computed through the combining of information about touch, vision, smell, and vestibular sensation in the hippocampus. Thus space represents a higher-order, abstract, cognitive function." Hippocampal "place cells" are not organized in neat little rows like for vision and touch, "but randomly," demonstrating a different kind of organization scheme. All three Nobel laureates won Columbia University's Louisa Gross Horwitz Prize last year for their discoveries. The Nobel awards in physics, chemistry, literature and peace will be announced later this week. The economics prize will be announced next Monday. The winners of each category split the prize money of 8 million Swedish kronor (about $1.1 million). Each winner also receives a diploma and a gold medal. Created by Swedish industrialist Alfred Nobel, the Nobel Prizes were first awarded in 1901. The winners always collect their awards on Dec. 10, the anniversary of Nobel's death in 1896. 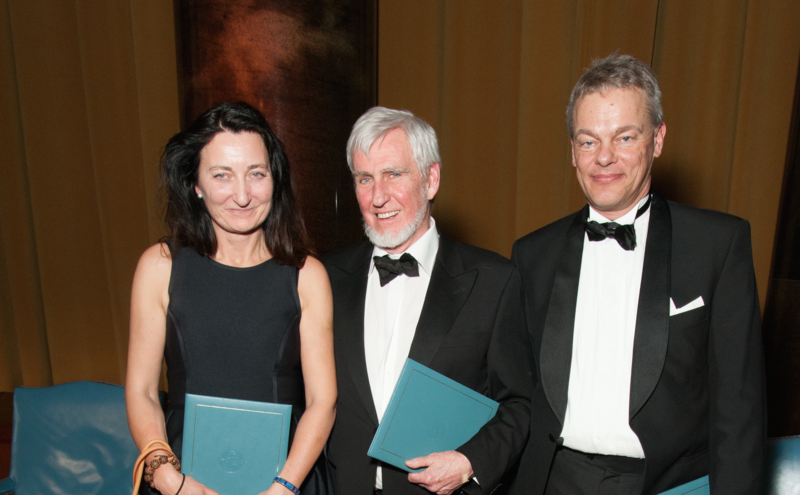 Last year's medicine award went to researchers who discovered how substances are transported within cells, a process involved in such important activities as brain cell communication and the release of insulin.